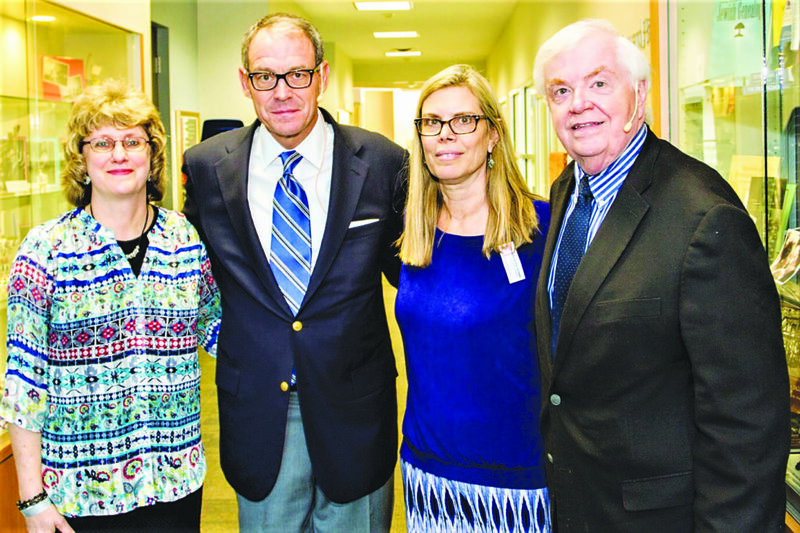 From left, Dallas BookFest Chair Liz Liener, author Daniel Silva, BookFest producer Rachelle Weiss Crane and Dallas Morning News writer Michael Granberry — here in 2016 — will reunite at 7 p.m. Monday to present Silva’s recently released book The Other Woman. Tickets are available online or at the JCC. The pages of the Aaron Family JCC’s Margot Rosenberg Pulitzer Dallas Jewish BookFest begin turning with Daniel Silva, in conversation with Dallas Morning News arts writer Michael Granberry, at 7 p.m. Monday at Congregation Shearith Israel. The Other Woman, the first of the 2018-2019 BookFest, offerings, continues the tale of legendary art restorer and assassin Gabriel Allon who serves as the chief of Israel’s secret intelligence service. The fast-paced, twist-filled modern spy thriller taps into the dangerous mounting tensions between Russia and the West. The July 17 release takes place in a village in the mountains of Andalusia, where a mysterious Frenchwoman begins work on a dangerous memoir. It is the story of a man she once loved in the Beirut of old, and a child taken from her in treason’s name. Long ago, the KGB inserted a mole into the heart of the West. The mole stands on the doorstep of ultimate power, and Allon is lured into the hunt for the traitor after his most important asset inside Russian intelligence is brutally assassinated. His quest for the truth will lead him backward in time, to the 20th century’s greatest act of treason, and finally to a climax along the banks of the Potomac River. “My parents Carol and Richard were teachers and readers, and as a child, I fell in love with adventure stories,” said the award-winning Silva, who has had 20 titles reach No. 1 on The New York Times best-sellers list. “I was a well-read child, and the blend of literary and commercial technique I enjoyed are definitely influences that have come into my books. His books translated into more than 30 languages, the Allon series — the character originally set for one book, The Other Woman the 18th — is now in development with MGM/TV to become a television series. A Florida resident who was raised in Michigan and California, Silva is married to CNN journalist Jamie Gangel, with whom he shares daughter Lily and son Nicholas. A literary fan of Graham Greene and Ernest Hemingway, Silva began his career with United Press International in San Francisco, then on the foreign desk in Washington and finally as Middle East correspondent in Cairo and the Persian Gulf. It was years later while working as an executive producer for CNN that he pushed forth to become a novelist, and he hasn’t looked back. Silva’s books — his first, The Unlikely Spy, two Michael Osbourne novels and the 18 Gabriel Allon series entries — are written in pencil by the journalist-turned-novelist on yellow legal pads. He generally begins writing each year on the Tuesday after Labor Day and hoping to finish by the following April Fool’s Day, immersing himself from mind to paper without an outline, his preference not to take many days off as his characters weave their way seemingly to events of today. • Alexandra Zapruder, Twenty-Six Seconds, Oct. 9. • Mohammed Al Samawi, The Fox Hunt, Oct. 17. • Mitch Albom, The Next Person You Meet in Heaven, Oct. 18. • Rev. Michael Waters, Stakes Is High, Nov. 1. • Nancy Churnin, Irving Berlin: The Immigrant Boy Who Made America Sing, Nov. 4. • Marilyn Rothstein, Husbands and Other Sharp Objects, Nov. 28. • Martin Fletcher, Promised Land, Dec. 6. • “Tal Keinan, God is in the Crowd, Dec. 10. • Father Patrick Desbois, In Broad Daylight, Feb. 6. • Jenna Blum, The Lost Family, and Pam Jenoff, The Lost Girls of Paris, Feb. 12. For more information or to register for events or sponsorship opportunities, visit jccdallas.org/main/bookfest or call 214-239-7128.